How does one become a great thinker? 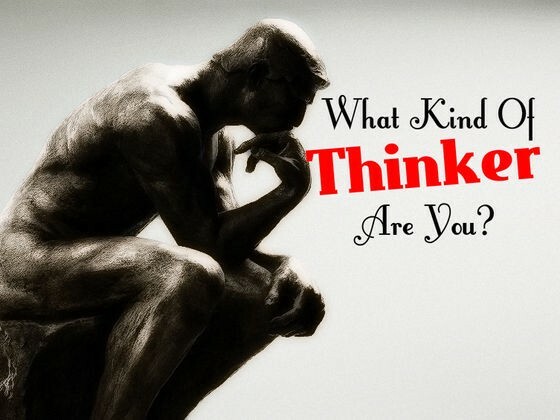 What really makes someone a “great” thinker? Even better, how does one become a better thinker? Albert Einstein once said, “everybody is a genius. But if you judge a fish by its ability to climb a tree, It will live its whole life believing that It is stupid.” There are some ways to learn the core principles of what makes us a true world changing intellect. This will be an in-depth overview, going over learning styles, the importance of knowledge, income to expect, personality spectrum, memory and so much more. To better demonstrate what I have discovered about learning from courses and my life, I should first reflect on what I and others may think of education and school, as well as recapping on the influence of my previous learning strategies. I will be Ranging from but not limited to memory games, using repetition and reading to help raise grades and intelligence. People often ask what do you expect to gain from school? Some will say that you can expect to inquire debt. Many will say that you will find success and yourself. Nevertheless, I for one think that is only a question we ourselves can answer. Psychologist even compiled compelling evidence that those who completed college were happier than those who didn’t. On average they have a better income/job, relationships, fulfilment in life, is proven to greatly increase confidence, self esteem, health and overall happiness (Which is different for everyone based on wants and needs.) When I first took my educational journey head on, I was full of innocence and not yet introduced to the harsh realities of the world. With the setback of having high levels of lead poisoning in my body, my teachers said that I would never amount to anything not even a janitor. But like countless others with dedication and hard work, anyone can change their brain. Studies concluded that our brains can continue to develop and change until death. Luckily for us with every passing new experience, skill, day, and year, our brains are constantly making new connections while reshaping the neurons and building new gray matter as well as folds (Crevices, sulci, ridges and gyri) untils our sixties before they begin to go in an adverse manner of growth. It’s also proven that when we learn in the manner that is natural to us we will excel to new levels. From mentors, teachers, parents, friends, spouse, coaches, books, and family we all need someone to help cut the learning curve and stay accountable. (If Hercules needed a mentor or coach it’s safe to say that it could help us as well.) Each one teach one is what drives us forward in life. In my case, my first support outside of family was when I met an amazing and caring teacher, whose favorite quote still echoes in my ears, “The sky isn’t the limit. Your mind is.” This pushed me to kill the self-doubt and strive to be arête. Furthering the research that group study session has a significant increase in retention, motivation and an avenues of expanded resources for information. Start to see school as not just something to do with no real means to an end besides debt. School and knowledge/education are something that has a real impact on people’s lives every day, and something that is greatly needed. If it is figuring out the best way to learn new material, what importance the personality spectrum can contribute to your success in school and how one class can change everything. Granted that there are many ways to do this without school (many have done this) but it all comes down to how we view it and what we are truly after. This learning profile can teach us a lot about ourselves and how we learn. From wants, learning styles, our personality and what we can really do. (For myself) How out of the four personalities (thinker, giver, organizer and adventure) I am a thinker and giver. As well being exposed to a variety of others. We can also use one of the nine teaching styles, (lecture, group discussion, small group work, visual focus, logical presentations, random presentations, conceptual presentations, detailed ones, and hands-on presentations) helping catapult me towards my goals. Another great way to increase the effects. Create a mission statement (Which is good for all categories of life, from business, wellness, love, personal, and more.) This can be made in a various of ways, from 3 words to a whole page and with even roles, goals and plans included. I am overly committed to getting a four point zero GPA over these next two to three years. I am going to receive my associate’s degree in psychology. I am always going to do my best in everything that I do. Going above and beyond to achieve what I long for, a good life with a loving family, happiness, success and to leave the world better place than I found it, even if it means getting helps from tutors, employers, mentors, asking my professors for advice/help and setting more than enough time to study while saving time for my businesses. What really makes a great thinker. Feel free to share, comment & subscribe to get my weekly blog/article first!